This film has twists and turns- it kept me guessing. It’s a psychological drama, for the most part. Frank, who’s older and more experienced w/ life, thinks he can handle Diane. But he doesn’t realize the complex/troubled mind she has, or what this petite lady is capable of. Diane offers him a cushy job as the family chauffeur w/ an apt. 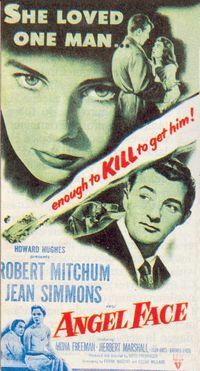 Jean Simmons REALLY shines in her role of the (unexpected) femme fatale, going toe-to-toe w/ Mitchum. She creates a complicated, troubled, yet VERY watcheable character in Diane. Mitchum, on the other hand, is sometimes TOO calm/collected. (I wanted to see more anger/emotion from Frank.) But his screen presence, charisma, and confidence almost make up for it. I never saw this film until last week, though it’s quite famous/controversial. 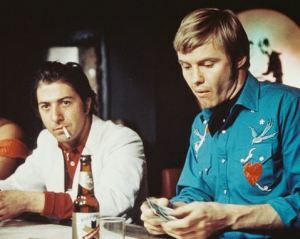 The two leads (Jon Voight and Dustin Hoffman) do a FINE job, no doubt about it! 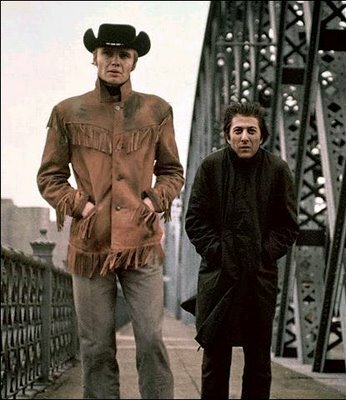 However, this film is difficult to emotionally connect to at times. The shooting style is unusual, esp. for its time. There are flashbacks that provide glimpses into a character’s troubled past, BUT don’t tell the complete story. There is a weird, disjointed, lengthy scene at a party towards the end. Joe Buck (Voight) is a handsome 28 y.o. dishwasher from small-town Texas who comes to NYC looking to work as a “hustler.” He dreams of charming and seducing older ladies and making big money. But he’s totally clueless. He happens to meet Ratso Rizzo (Hoffman), a talkative/street-smart trickster w/ a bad leg. An unlikely, yet mutually beneficial, friendship develops between the two opposites. In Joe, Ratso sees the strong, able-bodied guy he’d like to be. Ratso helps Joe navigate through the cruel city, and shares what little he has w/ the wide-eyed innocent.